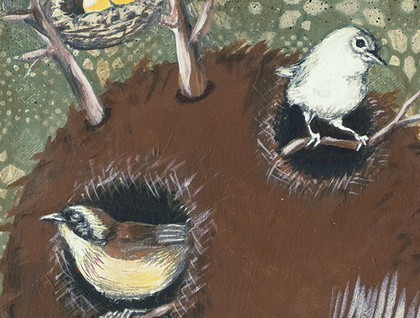 Like the laboriously constructed dwellings of its title, the original painting from which this print was taken was pieced together from a range of materials – board, spraypaint, acrylic, enamel and pencil. 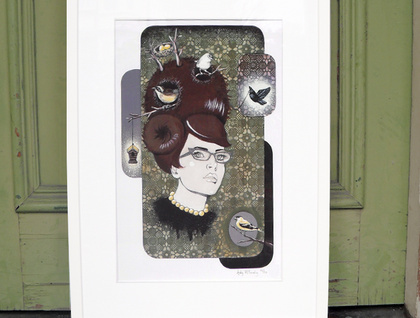 The first in a series of works called Habitat Hairdos, where creatures have colonised the elaborately coiffed locks of lonely girls, ‘Bird’s Nest’ looks to the aviaries of the animal kingdom for its inspiration. 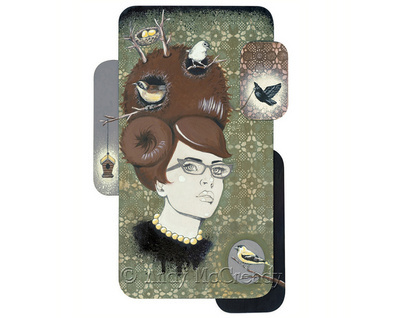 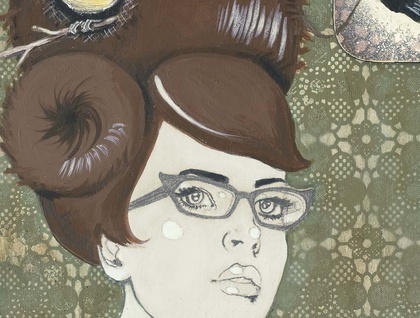 In this enchanted portrait, with its woodland colour palette of mossy greens and bark browns, birds perch on branches sprouting from an untamed bouffant, singing sweet songs for their mistress – a contemporary St. Francis in horn-rimmed glasses.